Audi Volkswagen Korea will test its self-driving A8 sedan on local city roads. 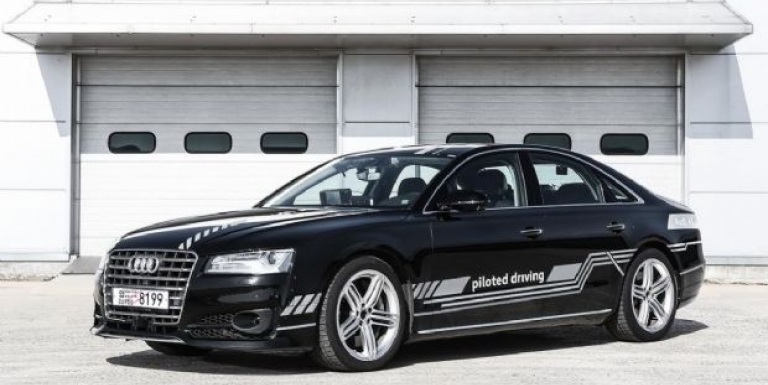 Audi Volkswagen Korea announced on March 7 that it obtained a temporary autonomous driving license from the South Korean government and would test its self-driving A8 sedan on local city roads. Audi is planning to continue developing its traffic jam pilot feature, a Level 3 autonomous driving technique, by accumulating data through the testing. Audi’s traffic jam pilot can be used at 60 km/h or less. When this function is active, a driver can remove his or her hands from the steering wheel although he or she still needs to focus on driving. The A8 sedan is equipped with various Level 3 components, such as radar and lidar for objection detection and a central driver assistance controller, in addition to Level 2 features like adaptive cruise control. The central driver assistance controller, which is the main part of Audi’s autonomous driving technology, shows 360-degree images through real-time processing of information collected by sensors. “We will accumulate various data on roads and vehicle driving environments in South Korea through the testing procedure, and the data will be the foundation of our development of more advanced autonomous driving technology,” said Rene Koneberg, head of Audi Volkswagen Korea.